Draping lace bordered with airy rib detail creates your new go-to cardigan. 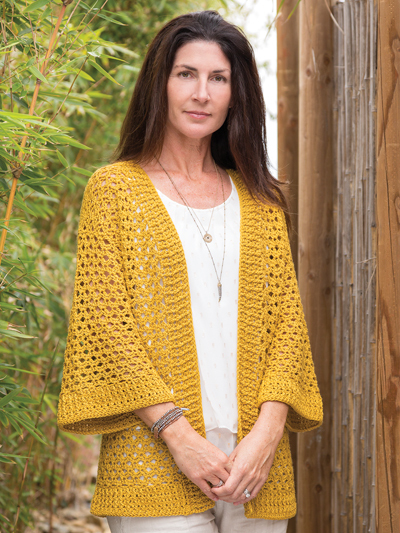 Using 2 easy stitch patterns, you will be wearing this loose-fitting cardi in no time! Design is made using 8 (9, 10, 11, 12, 13, 14, 15) hanks of Plymouth Yarn Cleo, a #3 light-weight yarn and a size H/8/5mm crochet hook or size needed to obtain gauge. Instructions are written for size: S (M, L, XL, 2XL, 3XL, 4XL, 5XL).